Twenty-one-year old Jack Passion, from Santa Cruz, California, sported a massive, thick, red beard that was only two years and three months old at the WBMC 2005 in Berlin. Jack's beard earned him third place and a bronze statue in one of the most competitive categories, full beard natural. Jack has vowed to come to Brighton in two years and hopes to place even higher there. The best part of this, his beard is still growing and could be twice as long next time! Jack along with several other younger members of Team USA, including Aaron Lewis, Carter Tew, Jordan Dauby (who took fourth in this category in Berlin), David Traver (world champ in 2003), Burke Kenny (in Berlin he took fifth in full beard, styled moustache) and Bob Gengler, insure that Americans could well dominate this category for a generation. Did David Traver attend WBC 2005 in Berlin? Before the event, I thought I had read that he could not make it this year. I had planned to attend, but due to my health could not. I am better now but one of the casulties was my beard had to be removed so a procedure could be done. I'm halfway back to where I was in Nevada. I will be in England-07. That's amazing! And he's only twentyone! man, you're gonna be a big glory for the world of beards!!! You forget the youngest competitor, 20 years old, who took 5th place in the Full Beard with Styled Moustache category against men twice his age and then some, plans to compete in 2007. Unlike JP, I don't trim my upperlip. Harumph! I have always admired your beard and your growing capabilities. Sorry to hear you had a health issue that required you to shave it off. How long does it take you to grow your beard out to the length it was back in Carson City? Strong, I assume you are the 20 yo competitor? I apologize, but I am not familiar with all of the competitors from the US. I have communicated with Jordan, and in the past have communicated with Phil. I knew him back when he first started his terrific beard he has now. Would be interested in seeing your beard and stache as well. Always great to see younger guys appreciate thier beard potential. I am amazed at your beard growth. And at 21. I only wish I had the ability to grow one that long. Mine is long and full, but nothing like that. How long is it? my beard in Nevada was only a year and half. It is our disire to bring the event to Alaska in 2009. Instead of trying to compete in our local contest last year I put on a different hat-Judge. I can now see how hard it is to grade these events. With folks like Jack and the other young competitors I feel Phil is right that the fullbeard natural is the toughest category. I went and checked out your "blog thing" and was equally impressed with your beard. 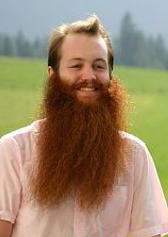 Being only 20, how long have you cultivated such a wonderful beard? The stache is amazing. Glad to see that the love of beards is still active among guys your age, when the goatee seems ever so prevalent. I am 42 BTW, and have been bearded in some form or fashion since I was 17. Uhhhhhhhhhhh!! Jpizzle in the hizzle with the bizzle!!! REp AMREICA SON!!! UHHHH!!! Jack: That is one very nice beard!! Congrats on 3rd place, Full Natural, in the 2005 WBMC! Congrats also to the 20yo who took 5th place Full Natural. Wow! David: I'm heartbroken to hear that you had to shave that trophy beard for a health issue. Sounds like you're making a good comeback. Hope to see you in the 2007 WBMC - Best wishes! Das Wunderkind! With "Passion"! The future of America's beard reputation rests on your shoulders... I'm selling my stock in Gillette and praying that you don't shave. i am in love with jack passion, the king of cowboy fashion. I see that guy sometimes around campus. One time a family of four fell out of his beard. I would love to brush this cruncher of a beard! I find that young lad's beard to be quite frankly the most attractive young beard ive laid my eyes upon in my well earned lifetime. I too am a fond grower of beard and other sorts of hair and i enjoy long walks on the beach. I have an outgoing personality and im not afraid to let out my true emotions if need be. I'm not one to hide in my hair as they say. Great story as for me. It would be great to read more concerning this topic. Thanx for giving that information. I couldn't last that long without shaving, I mean a beard can be the home of maybe some ticks, fleas.